In 1997 (February) I was on the ETT1 (Contiki’s European Training Trip – the first one). This is what I wrote about going to Gallipoli. 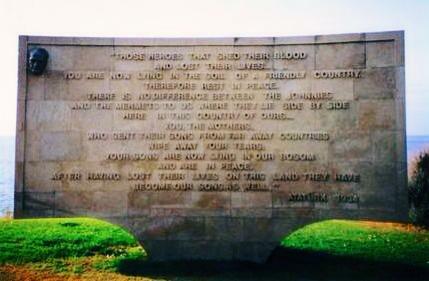 Attaturk’s Memorial, Gallipoli, Turkey. With thanks to Patrice Andersen. Leaving Greece we were on a pilgrimage – to Gallipoli. Most of us were antipodean and we were keen to see where our ANZACs had landed, fought and died, and to pay our respects with a brief service at one of the cemeteries. Our coach was met by guide, an older Australian gentleman who led us through the displays at the visitor’s centre. I was antsy and wanted to get out in the fresh air to see the trenches and touch the grave markers. We loaded up and drove some way up a dirt track, stopping at the section of coast the soldiers should have set down on. I was struck by the silence. It was cool in the pale sunlight, the sky a milky blue, so different from the sky that had delivered storms the day before. The water lapped the beach gently, no waves, no ocean sounds, no wind, just stillness, as though the ocean had been silenced along with those who lost their lives. I stared down into the clear water, only inches deep, and saw a smooth, snow white rock. I reached into the cold water and collected it; it fit perfectly in my closed fist. I remember wondering if it wasn’t illegal to take from the beach at Gallipoli. Probably. Selfishly I pocketed the rock. Side by side, here in this country of ours. We wound our way up the hill, passing trenches left open for nearly 9 decades, gaping holes the reminders of lost lives. At the top of the hill we stopped at one of the cemeteries, populated by Aussie diggers – most of whom were barely post-pubescent. We walked the rows of grave markers, the lawns were trimmed, small shrubs well attended. The ANZAC monument gleamed in the morning sun. Our heads were bowed to the markers as we stopped and read selected epitaphs. It was numbing to imagine the young men, terrified, landing on the beach in darkness, met with bombardment. I know that many of us were replaying that final scene from the film “Gallipoli” in our minds, realising the futility of the ANZAC and British assault as we stood upon the terrain. I stopped in front of one grave marker, its message burning on my brain, “To see you just once again, to shake your hand and say ‘well done’”. I turned; the tears that ran silently became a sob, and buried my face in Jerry’s chest. He put his arms around me and hugged me tightly. That day the trainers curbed their typical sarcasm. They joined in our reverence, our dismay. We laid a wreath and listened to “The Last Post” played on a portable tape player. One of us spoke, eloquently, a kind of prayer. “Lest we forget.” I touched the rock in my pocket, washed clean of any blood that may have marred its pure surface 90 years before. Such brave men and boys. I had never been so proud to be an Australian.